If you sleep on your back, credit to you! It’s the best sleeping position for your body. Although only 14% of us do it, it keeps your body evenly distributed which is good for your neck and back. However, it’s very important that your pillow isn’t too high, as this can lead to aches and pains. Thankfully, there are small selection of cleverly designed pillows for back sleepers. The Pancake is an adjustable layered pillow, offering the definitive tailored solution to your sleep needs. The outer shell encases 6 internal pillows which can be added or removed as necessary, making the Pancake ideal for those who frequently alter their sleeping position. The pillows are filled with microfibre, giving them a soft luxurious feel, and are machine washable for convenience. Available in 2 sizes, the outer case is made from 300 thread count cotton which stays cool in summer and warm in winter. Extra casings can be purchased separately for those who want to split their Pancake Pillow into 2. Good things come in small packages! At a slender 2.5 inches, you’ll hardly even see the Elite Rest pillow, but boy will you know that it’s there. The soft memory foam moulds around the head and neck, offering maximum support and comfort while keeping the spine in a neutral position. The Elite Rest pillow has a dual half pillow design for added versatility, meaning it is curved on one side and flat on the other. The memory foam is hypoallergenic, anti-microbial, antibacterial and bed bug resistant. Keep your spine in line with a Blue Wave Ultra Slim Gel-Infused pillow. At only 2.5 inches thick, this is the ultimate low-profile cushion for every weary head. The gel-infused memory foam supports the neck, bridging that all-important gap between the mattress and the head, giving a perfect balance of support while also keeping you cool all night long. The outer cover is derived from bamboo, which wicks away any moisture. The Blue Wave memory foam pillow is one of the best pillows for back sleepers. Available in 2.5-inch loft, 3.25-inch loft and 4-inch loft, it is both versatile and practical. The 2.5 loft pillow comes with a choice between extra firm or plush filling, meaning you can tailor your sleeping experience to suit your exact needs. Hypoallergenic, dust mite resistant and CertiPUR certified, this pillow is free from flame retardants, ozone depleters and other harsh chemicals. Prevent wrinkles and reduce acne naturally while you doze! The Your Face pillow brings a whole new meaning to the phrase ‘beauty sleep’. With traditional pillows, the constant pressure of the face pressed into the fabric exacerbates acne and causes wrinkles to form. Sleeping on the back is an excellent way to safeguard yourself against these unnecessary blemishes and furrows. However, with a flat pillow, your head and neck are unsupported at the sides while sleeping, leading to potential neck strain and discomfort. The Your Face pillow has revolutionary recessed side supports intended to bolster your head and neck without touching the delicate facial skin. It also boasts cooling flow channels which prevent overheating while sleeping. Pressure relieving memory foam offers more yield than harder conventional memory foam, without compromising on the fantastic support. The Your Face pillow is guaranteed to hold its shape for years to come. While primarily intended to enable back sleeping without awkwardness or strain, the patented design means that the Your Face pillow can also be used to side sleep without putting undue pressure on side of the face. It is a brilliant tool for facilitating the transition between side sleeping and back sleeping, and can be used by people recovering from facial surgery to ensure a comfortable night of sleep without the risk of damaging any wounds or stitching. Available in 2 sizes, the Your Face pillow is CertiPUR certified and PDBE free. 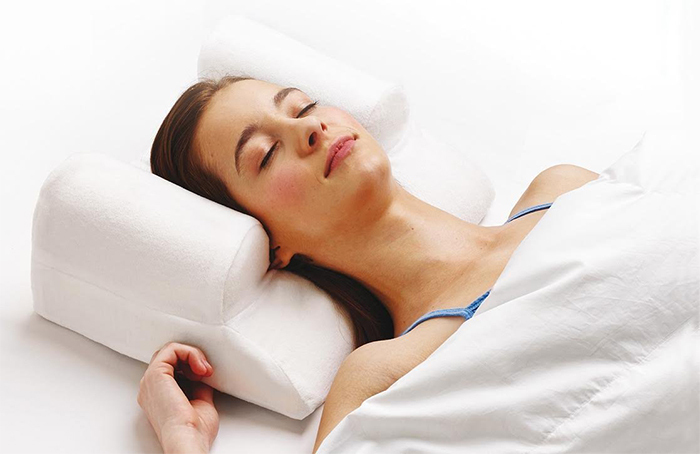 Wave goodbye to neck pain with the Royal Siesta Super Slim pillow. Perfect for back sleepers, this super-thin memory foam pillow encompasses the natural curve of your neck, relieving pressure and strain as you sleep. The dual design means that one side of the pillow is rounded while the other is flat, suiting all personal preferences. Hypoallergenic, dust mite resistant and antibacterial, the Royal Siesta pillow comes with a removable machine washable cover for hygienic functionality. Sleeping on the back is the most advantageous pose for maximum restoration. This may come as a surprise to some- after all, it’s a position that has a bad reputation for being uncomfortable, and only 14% of people go to bed on their backs each night. It may lack the luxurious feel of wrapping yourself in the duvet and embracing the plush pillows, but when it comes to what’s best for your body, back is definitely best. Sprawling out in the savasana pose puts the neck, shoulders, back and spine into a naturally neutral position. The entire weight of the body is distributed evenly, and provided your pillow is the correct height, your spine will be perfectly aligned, meaning you will wake from your sleep well-rested and pain-free. Along with this, back sleeping has been known to ease the symptoms of acid reflux and facial/jaw pain, as the face isn’t compressed against a pillow. The soldier is the healthiest sleeping position in terms of spine and neck alignment. The back is flat against the mattress and the arms lie down along the sides of the body. People who sleep in this position are less likely to switch poses during the night. The starfish is similar to the soldier position, except the arms are splayed upwards instead of down by the sides. Like the soldier, the starfish stance is also beneficial for spinal health. However, the positioning of the arms sometimes causes tension across the shoulder blades and in the elbows, leading to aches and pains. Pillow height (known in the business as pillow ‘loft’) is a crucial factor which determines how well the neck and back are propped while sleeping. Many people are deceived by their eyes, believing that the plusher a pillow looks, the more comfortable it will be. Believe it or not, pillows can be too thick as well as too thin, and either extreme will result in poor neck alignment, pain and even constricted airways, affecting your sleep quality and physical comfort. In general, pillows with a low-medium loft tend to suit back sleepers the best. This is because the head only needs to be a short distance from the mattress to maintain a neutral spinal position. Medium-high loft pillows are more conducive to side sleepers, as there is more space to fill between the end of the shoulders and the side of the head. Heavier people often require a lower pillow as their weight causes them to sink deeper into the mattress, thus reducing the distance between the head and the surface. Conversely, lighter people don’t exert as much pressure on the mattress and therefore sleep higher, requiring a loftier pillow. Firmer mattresses result in higher sleeping as the body does not sink deep into the material. This means that a loftier pillow is needed to fill the gap between the surface and the head. On the other hand, softer mattresses envelope the silhouette, meaning the head is ultimately closer to the mattress so only requires a thin pillow. It sounds complicated, but as a general rule of thumb, back sleepers favour a thinner pillow with a medium-low filling. The goal is to keep your head as near to the mattress as possible. When back sleeping, the head is centred naturally between the shoulders, so the space between the mattress and optimal head position is small. Sleeping on a pillow with a high loft will arch the head forward into an unnatural position, causing neck strain, shoulder and backache, and restricted respiration. Not favourable conditions for a satisfying snooze! Supine sleeping puts the spine in a neutral position, reducing compression on any sore spots and allowing the back and neck time to recuperate from the stresses of the day. Lying on the back also distributes your weight evenly, avoiding extra strain on the pressure points. Sleeping on the flat of the back can sometimes increase tension in the hip joints. Placing a pillow under the knees will help to dissipate this tension. Is your sleep plagued by GERD? Are you constantly torn from your wildest dreams by agonizing heartburn or acid reflux? Then sleeping on the back might be the solution you’re looking for! Lying in this position naturally elevates the head, placing the esophagus above the stomach. This prevents food or acid from coming back up, reducing the symptoms of reflux. It’s a no-brainer! Anti-ageing? Now you can do it in your sleep! Side and stomach sleeping invariably result in fragile facial tissue being squashed into the pillow. In turn, this leads to unwanted and preventable sleep lines. Switching to a back position will give your lovely face that much needed breathing space with no compression on the skin. If you are currently a side or stomach sleeper and you want to change to back-sleeping, you may discover that the process is more difficult than it sounds. Thankfully, special pillows are available to help smooth the transition, and breaking the habit is something that will save you money and tears in years to come. Back sleeping is the most beneficial position for the spine, neck and shoulders. As babies, everyone starts out sleeping on the back. Then years of bad posture and conditioning morphs us into achy, tired side or stomach sleepers. Unfortunately, for most adults, back sleeping doesn’t come naturally and staying supine while sleeping requires some training and discipline. Like most super healthy things, back sleeping is unquestionably an acquired taste. It takes perseverance (and sometimes a little ingenuity too! ), but the results speak for themselves- reduced back pain and GERD, less night waking, fewer wrinkles and more energy in the mornings. Who wouldn’t want all that! If you have slept on your side or stomach most of your life, then switching to the back is a big adjustment and will take some getting used to. There are 2 main obstacles to overcome in your sleep position training. Help! I Keep Turning Over in My Sleep! Says every sleep position changer ever. Seriously. Rome wasn’t built in a day, and likewise, you are not going to undo a lifetime of bad sleeping habits in one night. So chill out, breathe deep and commit yourself to the process. It could take a week, it could take two. Just keep telling yourself it will be worth it. If you’re into the whole pain/negative association thing, you could try snapping yourself with an elastic band every time you feel yourself rolling over. However, that could potentially result in less sleep than more (and OW!). Thankfully, somebody along the way figured out that strategically placed positioning pillows help to prevent the body rolling over, without any pain or sleep loss. Everybody is different, so you’ll need to experiment to see which placement suits you best, but generally, placing one pillow between the arm and torso on each side helps. Sleeping on a pillow designed to hold your head in place is another good measure. My Lower Back Hurts! I Thought Back Sleeping Was Supposed to Reduce Back Pain! Some people initially find that sleeping on their back puts strain on the hips and causes discomfort in the lower back. Not what you want when you’re trying to sleep! Ensuring that your current pillow is thin enough for a back sleeping position is the first step to making yourself more comfortable. Stretching the hip flexors before you go to bed is another good tip. If the soreness persists, then a pillow placed under the knees can ease the pressure on the hips. Special wedge pillows are available for this specific purpose, although a regular old plushie will do too. A rolled-up bath towel placed in the curve of your back will give added support and help to maintain the optimal alignment. Back sleeping will feel alien in the beginning, and there might be a few nights of interrupted slumber in the beginning, but your body will be grateful for the rest of your life! Beware! Sleeping on Your Back May Cause Snoring! Up to 50% of people snore at some point in their lives, and it can wreak havoc on their sleeping patterns and relationships. Certain traits make people more likely to snore, and the key to a peaceful night’s sleep lie in finding the cause. Obesity is a common cause of snoring, as extra fat in the neck weighs down on the throat, restricting breathing. Unfortunately, sleeping on the back is another common culprit. This is because lying on the flat of your back makes the base of your tongue and soft palate collapse backwards, creating a vibration when you breathe. However, that doesn’t mean that back sleeping is out. Identifying the risk factors and seeing what you can do to rectify them can help to solve the problem. Staying hydrated, keeping your bedroom dust-free and reducing cigarette and alcohol consumption are big steps to silencing the mighty snore. Obstructive sleep apnea is a common condition that impairs breathing periodically during sleep. Similarly to snoring, this happens when the muscles at the back of the throat relax, narrowing the airways. Breathing is diminished for 10-20 seconds before correcting itself. Episodes of OSA occur 5-30 times per hour, and although the sleeper may not remember them once awake, the interruption to sleep will cause fatigue and exhaustion. Sufferers of OSA are more likely to develop hypertension and heart disease, and can encounter complications with anaesthesia. Sleeping on the back has been known to exacerbate sleep apnea. A sleep study conducted among 30 apnea patients found that subjects were twice as likely to suffer from episodes of impaired breathing when they were lying on their back, compared to when they were side sleeping. This is more than likely down to the effect that gravity has on the upper airway. These findings have led doctors to advise OSA patients against back sleeping, however, if you are serious about the benefits of back sleeping, there are special elevated pillows available that will keep your airways open while you sleep. Back sleeping isn’t advisable after the 16th week of pregnancy, and not just because of the awkwardness. As your pregnancy progresses and your bump gets heavier, lying on your back can cause the womb to lean on the vena cava, which is the large vein that carries blood to the heart. This restricts blood flow and can cause fainting. So unfortunately, you’ll have to find another way to ease that heartburn and prevent those wrinkles. Your spine and posture will benefit greatly from back sleeping, but a substandard mattress can undo all your hard work. The body’s entire weight is distributed evenly while sleeping on the back, so a mattress with a strong core system is crucial. Pocket spring mattresses are the ideal choice for people who sleep on their backs. The individual springs move independently, contouring to the body as it shifts around. A flat back needs a firm surface, and for ultimate buoyancy, an orthopaedic mattress will guarantee night after night of blissful slumber.